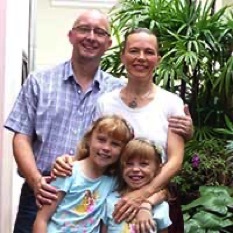 Part of a team serving 100 people groups in East Asia, Jason and Tracy Day (pictured here with their two children) are CMS mission partners based in Thailand, playing a key role in the bigger story of sharing the gospel in Asia. Jason is seconded to OMF International and is part of a team that is more than 1,400 strong from over 40 nations, sharing the gospel in East Asia. Jason's current role involves administrative support for field members. 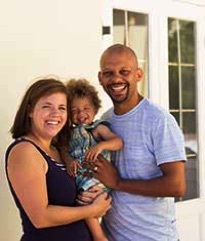 Vernel and Katie are missionaries in South Africa with YWAM (Youth With A Mission). YWAM is an international, interdenominational organisation with the aim: to know God and make Him known. Vernel is South African and Katie hails from near Buxton in the UK. They met while working with YWAM in Cape Town and were married in 2012. They have two sons, Judah, born in 2014 and Zach (2016) and a daughter, Florence-Mae Thembisa, born in April 2019. Vernel joined YWAM after graduating from Discipleship Training School, which he joined right out of secondary school. He mostly works with young people. He is passionate about Leadership Development, mobilising people into missions - and his beloved UK Premier League soccer team, Arsenal! Katie’s background is in healthcare. She was a registered nurse in the UK before coming to serve with YWAM Cape Town in 2012. She is passionate about helping people to live in wholeness and to reach their God-given potential. In 2016 the Levendals moved to Jeffrey’s Bay in the Eastern Province of South Africa to help pioneer YWAM and join the leadership team there. Jeffrey’s bay is one of the worst run and poorest regions. It is the province where Nelson Mandela and many other influential leaders came from who have impacted South Africa in such a positive way. 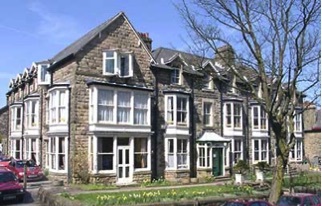 For a number of years BCC met at Charis House (pictured left), headquarters of the charity Good News Family Care - a Christian organisation that provides a 'safety net' for families in crisis and supported accommodation for mothers and children. It is our privilege to continue to stand with them as they show God's love in action. Tracy works as a part-time volunteer in the Chiang Mai International School nurses' office. Free a Dalit Child enables partnership between sponsors and Dalit children via schools in India. This not only helps the children to acquire an education but also gives them dignity, freedom and self worth.